During September 2005, a salvage excavation was conducted at Khirbat Fardisya, northeast of et-Taiyibe (Permit No. A-4589; map ref. NIG 20118–30/68723–31; OIG 15118–30/18723–31; HA 120), prior to the construction of a senior citizen’s day-care center. The excavation, undertaken on behalf of the Israel Antiquities Authority and underwritten by Bar Agam Ltd., was directed by A. Massarwa, with the assistance of V. Pirsky (surveying and drafting), S. Mahajna (photography), M. Shuiskaya (pottery drawing), and E. Yannai and M. Peilstöcker (pottery reading). 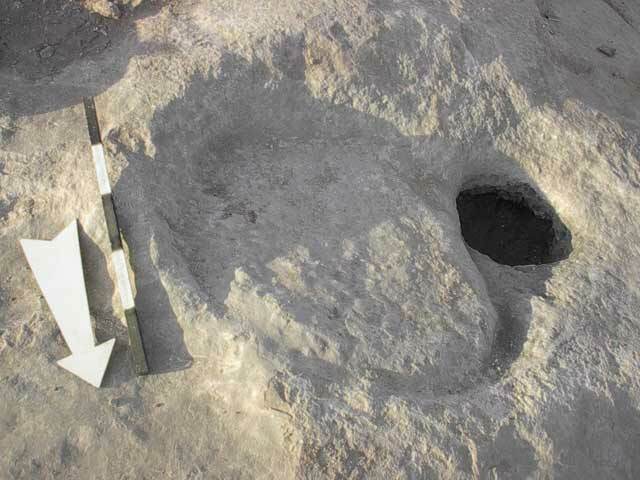 The excavation was carried out along the northeastern fringes of Khirbat Fardisya, at the top of a steep slope. 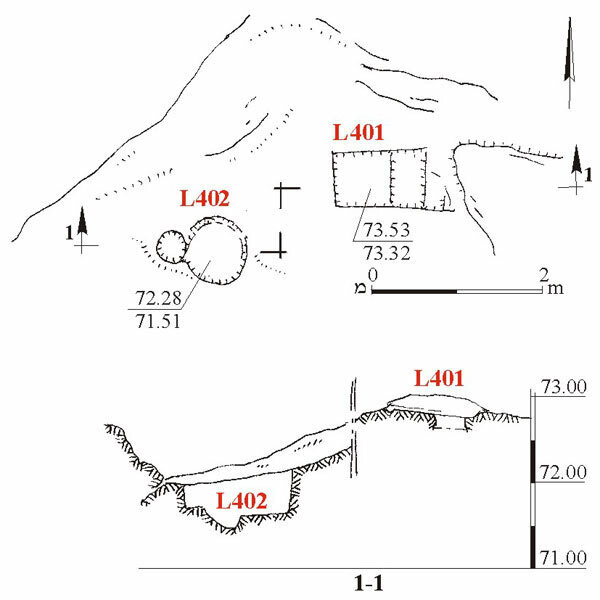 Two excavation areas (A, B) were opened, 40 m apart. Three squares were opened in the eastern Area A, revealing a wall. 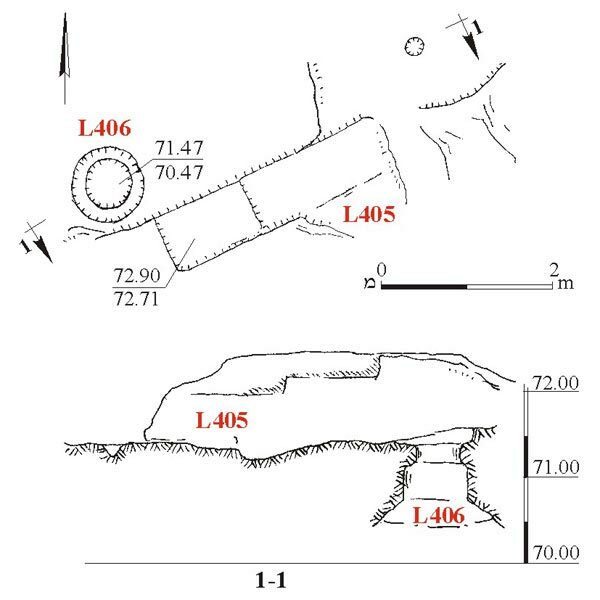 A cist tomb, a winepress, a quarry and 3 shafts, all hewn in limestone bedrock, were exposed in Area B (75 sq m). The ceramic artifacts recovered from the excavation dated to the Iron Age. A sarcophagus from the Roman period was discovered nearby in 1993, during antiquities inspection. Area A (Fig. 1). Remains of a fieldstone wall (W10) of dry construction, oriented east–west and preserved a single course high, were exposed. The fill between the stones in the wall contained several potsherds from the Iron Age (c. tenth century BCE), including jars (Fig. 2:8). It seems that the wall was part of a building that mostly extended beyond the limits of the excavation. Area B. The cist tomb (L401; 0.8 × 1.0 m; Fig. 3) was plundered in antiquity. The small winepress (L402; Figs. 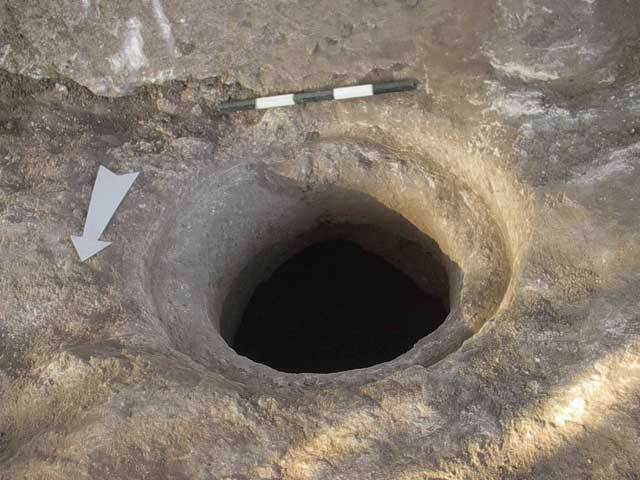 3, 4), exposed 1 m south of the tomb, included a round treading floor (diam. 0.9 m) and a round collecting vat (diam. 0.4 m). The quarry (L 405; 1 × 3 m; Fig. 5) was 4 m west of the winepress. Severance channels that separated the stones from bedrock were discerned in it. The excavation of the three round shafts was suspended due to safety precautions. One of the shaft (L406; Figs. 5, 6) was hewn next to the quarry. The soil fill in the shaft contained fragments of bowls (Fig. 2:1–3), kraters (Fig. 2:4, 5), cooking pots (Fig. 2:6, 7) and jars (Fig. 2:9–12) that dated to Iron II. 3. 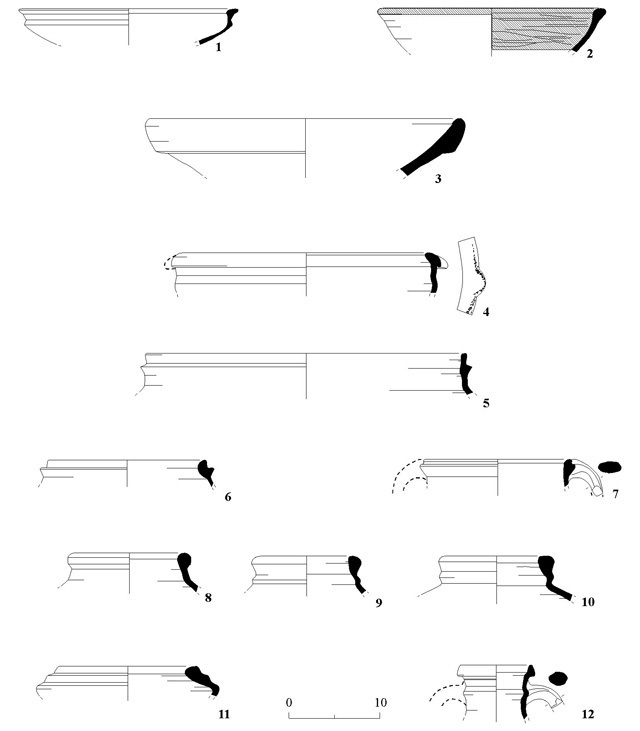 Tomb 401 and Winepress 402, plan and section. 4. Winepress 402, looking south. 5. Quarry and Shaft 406, plan and section. 6. Shaft 406, looking south.